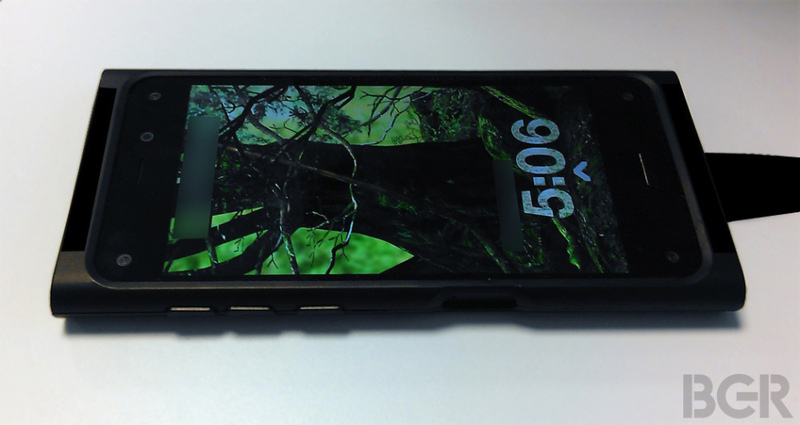 It hasn’t even been a week since rumors popped up about a June announcement for Amazon’s(s amzn) smartphone, but there are already leaked photos of the reported device. The Boy Genius Report published images of the alleged handset on Tuesday, along with detailed specifications of the phone. The images back up earlier reports of multiple head-tracking cameras on the handset, which is encased in a shell likely to hide design details. You can clearly see camera sensors in the four corners of the display, as well as a standard front-facing camera that would likely be used for video chat. The phone will also reportedly have a 13 megapixel rear camera, use a Qualcomm(s qcom) Snapdragon processor and run a custom 3D-like interface. The latter aspect may mean the user interface will have a parallax effect, with the device background moving in relation to where the cameras see head movement. BGR says the phone will have a 4.7-inch, 720p display, so from a hardware perspective, the screen may not challenge currently available flagship phones. This phone may be the first of two models this year with a less-expensive edition following, notes BGR, although no pricing details have leaked or appeared officially. It’s extremely likely the phone will run on a variant of Android(s goog), which is the approach Amazon takes with its tablets and Fire TV. That means Amazon gains all of the usage data to better understand its customers and show product recommendations — both physical and digital — on the device. Look at the bottom of the screen just below the display. There are two more spots that look like cameras. I think this is just a design element and not actually stereoscopic cameras. Unless you expect me to believe there are 5 cameras on the front and who knows how many on the back. This is not likely.